At MUBI, Doug Dibbern has composed a magnificent meditations called "Cinephilia, the Science of Hope, and the Sacred Ground beneath the Grapeland Heights Police Substation in Miami, Florida" in which he fantasizes about obscure objects of desire -- movies seen and unseen (and perhaps unseeable) -- including the lost "Ambersons." ["Ambersons" editor Robert] Wise met Welles in Miami on February 5, 1942, at the cartoon studio that the Fleischer Brothers had built a few years earlier to escape their union troubles in New York. They spent the day together watching a rough cut (without music or sound effects and missing some scenes) and recording Welles's beguiling voice-over narration ("George Amberson Minafer walked homeward slowly through what seemed to be the strange streets of a strange city. For the town was growing... and changing. It was heaving up in the middle incredibly. It was spreading incredibly. And as it heaved and spread, it befouled itself and darkened its sky."). In March, RKO shipped Welles (now in Rio) a new 110-minute version of the film that incorporated all the changes he'd made with Wise a month earlier. 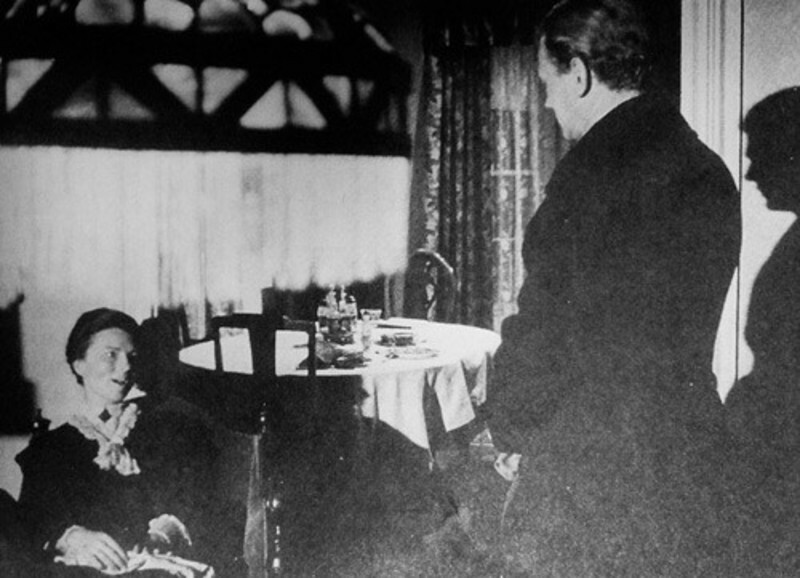 It seems that this cut was the same version that was previewed in Pomona to famously negative reviews (though Jonathan Rosenbaum has pointed out that while the majority of that audience's preview cards were negative, some people in the theater that night wrote that the movie was "an exceedingly good picture," "the best the cinema has yet offered," "a masterpiece," and "the best picture I have ever seen."). The unruly teenage audience unnerved George Schaefer. Meanwhile, Robert Wise was unexpectedly unable to overcome State Department restrictions on wartime travel to meet Welles in Brazil. A pall had settled over the earth. If one stopped at the corner of Sunset and Vine and listened carefully, one could hear them: a flock of invisible vultures the size of battleships hovering over Los Angeles, circling in an infinitesimal descent. The mutilation of the movie that Welles later claimed was better than "Citizen Kane" had officially begun. The print that RKO sent Welles in Rio may be the closest thing to a definitive version of the movie that ever existed (Wise also assembled a 132-minute version for a later preview in Pasadena, which many scholars seems to think would have been the better film). The Rio print had all of Welles's corrections to the version he'd seen in Miami, including all the sound effects, his narration, and Bernard Herrmann's score. For those scholars and cinephiles who still believe that the original film may turn up one day, it is this Rio print that offers the last, best hope. Welles always intended to return and dig the film up, of course. The Fleischer Studios broke up soon after he and Wise were there and the building was sold off. After Howard Hughes dissolved RKO, Welles almost made the journey, but the disputes over the ownership rights to various arms of the company frightened him off. Then, years later, the legal battles over "The Other Side of the Wind" convinced him that the movie was better off where he'd left it. I've found the old Fleischer Studio's address. Yes, the building is still there. In 2007, Miami-Dade County turned it into a police station. You can find it on Google Maps. Sometimes late at night when I'm feeling the chill of the world, I stare at the image of the Miami Police Grapeland Heights Substation and feel calm. My rational mind knows that the story I've concocted is false, but my heart tells me that The Magnificent Ambersons is still buried there. Its presence there gives me hope. Welles never went back, but even on his deathbed he knew that someday, maybe hundreds of years hence, "The Magnificent Ambersons" would find its way back to us. I believe it, too.